In the third episode of TEN7's Blueprint for Operations series, we explore the human element of how we work together as a group with Eric Zakovich from Employee Strategies. IVAN STEGIC: Hey Everyone! You’re listening to the TEN7 Podcast, where we get together to talk about technology, business and the humans in it. I’m your host Ivan Stegic. We’re continuing our discussion of TEN7’s Blueprint for Operations today. This is the framework that we realized we use at TEN7 in our daily work. And, as I’ve said before we’re now documenting it, speaking about it, and we’ll be open sourcing all of it this summer. In this episode of the Podcast, we’re going to focus on the human element. In my experience at TEN7, it’s simply not enough to have the right tools in place for every aspect of the software development process. Not only are you trying to build something, on a deadline, for someone you’ll hope will love what you’re creating, but you’re also working with a vast array of tools and about a million different moving pieces. And, you’re doing that with other people, who have the same number of variables coming at them at any given time. The ability to get on well with your colleagues to truly work as a team really makes a difference in getting to the same destination at about the same time. The team dynamics, the company dynamics, this thing we call "culture", turns out to be very important in the Blueprint for Operations. So, today, we’re going to spend some time digging into the human element of the Blueprint and returning to the Podcast is Eric Zakovich, the principal consultant at Employee Strategies, an organizational development firm here in Minneapolis, whose mission is to create great places to work. Eric, it’s my pleasure to welcome you back to the Podcast. ERIC ZAKOVICH: I’m really excited to be back. To be a second time guest means that the first one wasn’t too bad. So, I’m honored to be here and excited to talk about the Blueprint topic. IVAN: Yes, thank you. It’s wonderful to have you with us again. I’ve been really excited about Blueprint and the fact that we’re collaborating together on a project for a client. ERIC: It’s a treat for me actually. It’s not only fun, it’s finding a new way to add value to clients that I think is even greater, that collaboration produces something that’s even greater than one person could do on their own. Putting our minds together to help a client is really special to me. So thanks. ERIC: Yea, you said it much simpler and clearer than I did. IVAN: I didn’t come up with those words though. In prepping for this podcast, we were kind of just talking ahead of time that you don’t really know what the Blueprint is. I mean we’re collaborating together, we’re putting our minds in and trying to solve something for a client that has some problems, and I think what we realized at TEN7 is we don’t really have good documentation around what our process is internally that includes the non-technical software development stuff. So, maybe we should talk a bit about what Blueprint is first, and then we can kind of get into what I was hoping to get into later on. ERIC: I was thinking about it…it’s like when you live something but you don’t know you’re living it and when you can articulate it or explain it or learn what it is that you’re experiencing, you know it deepens your ability to make an impact. I was super curious to kind of get into what is Blueprint. Why did you decide it? How did this happen? IVAN: Yea, that’s a good question. It’s the name we’ve chosen for this thing. One of them was Manifesto, and we decided that those weren't good descriptives of this thing we’re doing. Framework is a good word as well, but when you say framework, at least in our industry, we think of software development frameworks, and we didn’t really want to be biased. Blueprint is a way of describing how TEN7’s team operates to make our clients happy. And it encapsulates not just the DevOps kind of the way we get software from a developer's computer out into the real world, but it also talks about the tools we use to communicate as a distributed team, the tools we use to manage the issues that come up in the process of getting code live, the tools we use to manage passwords and share credentials with clients and amongst team members, and most importantly, it also includes the human dynamic, the human element, how people interact and what the best way to interact is. It’s a recipe for how a team might work and what tools it might use, but it’s not a prescription for the exact medicine that will fix your particular issue. So, the concrete example is password management. In the Blueprint, password management is an important aspect. So the Blueprint would say your team and the people you work with need to have a way of sharing passwords, securely. They need to have the right permission sets so that the right members of the team have right access to the right credentials. But it isn’t going to say you have to use 1Password or you have to use LastPass. It might suggest a couple of solutions and give examples of how they might be implemented, but it's not going to be strictly prescriptive on which solution to use. At TEN7, we happen to use 1Password, so that’s what our experience is. At Employee Strategies, if you were able to implement those, you might choose something else. ERIC: You know, hearing you describe that it connects very much to my work. I think when I’m working with teams or with individuals, we don’t have a “here’s the ground rules you need to have as a team.” We have sort of some principles that we certainly operate by, one of which when working with a team, they have to have a way to have conflict. Some teams, it’s appropriate to use really strong language so when people are talking, they’re very direct with each other, they might use words that you wouldn’t hear on a playground or in a very rough setting, and others that would be completely inappropriate. So, teams have to figure out what is the right language, what is the right way that we talk to each other, what is the right way we deal with differences, and so I’m always trying to help them uncover what is the right way for them and not prescribing for them a specific way of doing it. IVAN: What do you call that? Do you call it framework, or a recipe? What’s the word you use? ERIC: We have something that we follow called our Proven Process. Our Proven Process is the way we consult with clients and guide them along the journey. So we’re always seeking to understand the system first, so we’re digging in, we’re doing some kind of assessment. And then we’re determining what a potential solution might be. We’re implementing that solution and we’re checking on it right? But that’s always tweaked and customized to that clients environment, that context, because that really matters. We call it our Proven Process, it’s the process we get, but I don’t know if we have necessarily – I like the word Blueprint, because it’s kind of like, we got to design the house, build a house, and here’s a plan. IVAN: Here’s how we’re planning on doing it. And you can choose whatever stucco color you like or whatever brick you like, or whatever wood you like, we just know that we need a wall, right? ERIC: Yea. And I think to play out that house analogy a little further. Sometimes you’re building in a rocky terrain, sometimes you’re in northern California, you got to build on the side of a cliff practically, sometimes you’re in the plains of Nebraska and it’s flat, and maybe it’s sandy. You know, you just have different environments you’re doing this stuff in. So, picking the right approach for your environment, I think, is really important. It sounds like that’s what you’re trying to help clients with. IVAN: I think so. I think that’s what we’re trying to do and I think the basic premise of the Blueprint is that tools aren’t enough. It’s nice that you could choose 1Password for password management, it’s great that you decide to use Git and Slack and JIRA, but putting those in place, and processes in place, isn’t enough for them to be used, or even used successfully. It’s kind of the team dynamics that are an important part of that as well. So we need to be cognizant of that. The greatest thing that I ever got from Employee Strategies was the realization that there was a method and a formalism and data and science behind how people interact and how people get classified and categorized. I know there are very many theories around this, and it sounds like Employee Strategies has decided to focus on one of them, at least in my experience. And you could speak a whole lot better to whether that’s true or not. My understanding is that you guys have based this consulting around the five behaviors of a cohesive team, and I wanted to hear if I actually understand that correctly. Then I have a follow-up question that confuses me and that's about the five dysfunctions of a cohesive team, and I would love to hear you talk about the differences between those as well. ERIC: So, you’re talking about sort of our, we have a belief that there are certain commonalities that must exist within a team environment. So a team environment, take a second to define that, for anybody who’s listening or maybe works independently or has some limited experience working with a team, but a team environment is where people have to work cooperatively toward some goal. Together they have to produce the results, they really couldn’t do it independently or maybe on a scale they need to, independently. So that’s sort of my definition of a team – a group of people that have to work together to achieve something. We believe that there are basically five components that make up an effective team. The absence of any of those components will result in a team getting suboptimal results, or not even close to the results they’re after. So, those five dysfunctions that you referenced are when they’re absent, or when they’re not working well. When the five behaviors are there, that’s when they do exist, so I’ll take a moment and walk through that if that makes sense to you. IVAN: Please do. And I think you’re leading into the discussion of the pyramid that we’ve been using? ERIC: Absolutely. So we use this pyramid model and at the base of this pyramid, and when we think about pyramid, what makes it such a strong structure, something you can’t topple over? If you think of the Egyptian pyramids, they’re still there, and they’ve been there for thousands of years. You can’t knock them over. A pyramid is a very stable, strong structure. At the base of this pyramid, the base of what makes an effective team an effective team, is trust. So, the first behavior of a cohesive team is the existence of a strong, trusting foundation upon which everything else is dependent. Absent that, there is a lack of trust, or little trust or damaged trust. When a team has that, it can’t engage in the other behaviors. So, that’s the first dysfunction or behavior, depending on what’s going on. If it’s working, it’s the behavior of a cohesive team. It’s not working, then its dysfunction. ERIC: So, layered on top of trust, the second one that we look for when we’re working with teams is can the team engage in productive conflict? Some people hear the term conflict and it makes them very uncomfortable. We both live in the Midwest, Ivan and you know how people are here? ERIC: Conflict is a really dirty word here, isn’t it? ERIC: Yea, I mean so nobody here likes it. I know other parts of the world like really embrace conflict. We don’t, so people hear that word and they get a little bit fearful and the way we try to reframe thinking about conflict, and we call productive, we want teams to have productive conflict, is that there are differences of opinion. That’s natural. That’s normal. That’s healthy. The best teams have differences of opinion. The best teams also don’t shy away from that conflict. They get into it. They talk about what’s going on.They challenge each other’s ideas, opinions. They do it in a way that maintains safety. We kind of say there’s this little line that if you cross the line, maybe you damage a relationship. If you’ve got that trust that we talked about, that foundation, that’s ok. You can recover from that. Less effective teams are teams that are dysfunctional. They can’t do that, so people hesitate because they know “I can’t cross this line.” They’ll hesitate to share their difference of opinion, or they’ll hold back, and they’ll walk out of that meeting and say “you know, this is never going to work. Ivan didn’t think about this thing." And they should’ve brought it up in the meeting but they didn’t. IVAN: So the trust level has an element of vulnerability, to be able to engage in that kind of conflict, because you kind of have to put yourself out there to have that productive conflict. ERIC: I’m glad you used that word vulnerability. That is the kind of trust that we’re talking about. There’s predictive trust, that’s the kind of trust where any two people who work together know how each other are going to act. If you work together long enough you’ll figure it out. I know Tony’s going to be late with his assignment because he’s always late with his assignment. Or I know, Spencer’s going to come through because she always comes through. We have predictive trust. That exists. But, what we’re talking about with teams is we want vulnerability-based trust. That’s the kind of trust where people say “I don’t know what I’m doing right now.” Or “I’m not sure this is going to work.” Or “I’m not good at that.” Or “I need help.” When teams can do that, that’s the kind of trust that can really propel them. So that enables conflict. You can have that kind of productive conflict if people are willing, like you said, to put themselves out there. IVAN: So, the base is trust with a splash of vulnerability, then productive conflict on top of that. The next row, the middle of the pyramid must be based on those two bottom ones. They have to exist to be able to have the third part. ERIC: Yea, absolutely. So the third part is the cohesive teams will be able to commit to a goal, or to a course of action, whereas dysfunctional teams will not be able to do that. Or, they’ll say they commit but they really never do. They don’t follow through with it. They find reasons why something can’t happen. They don’t overcome the obstacles that get in their way. So, the best teams, the teams that have trust, once you engage in that productive conflict, you can commit to a course of action. So, that’s the third behavior, is true commitment to a goal, to your purpose, to your cause. You can’t get there without, I like to say, "you have to be able to weigh in to buy in", so when teams can engage in that productive conflict and weigh in on what are we doing and why are we doing it and is it the right thing, they can truly commit. If they don’t do that, it’s hard for people too. IVAN: So you’re committing to the destination and where you’re going, but you might not agree with the path that you’re taking. But, because the team has come to an understanding that that’s the path we’re going to take, you’re going to come along for the ride, because you were able to trust your team and have that productive conflict to take that path and commit to going there. ERIC: Yea, if you could see your idea in the picture or you know that it was at least on the table and considered and maybe the team went a different way, but if you could see that then you could really buy into that, that vision, that purpose, that goal. IVAN: And then so what’s the next one? The fourth behavior? ERIC: So, once we’ve got something that we’re committed to, we could hold each other accountable to that. So without clarity around what we’ve committed to, we can’t be accountable to any results or any set of behavior or any goals. So without that commitment, we can’t get to accountability. So once we have accountability, team members will say, “Hey, I thought you were going to do X. Where’s that at? What help do you need?” Or, “Hey, I know I’m on the hook for this. It’s going to be late.” Or, “Hey, I’m going to need some other resources.” When teams are truly accountable, and I’m talking like team accountability here, not just individual hold-the-persons-feet-to-the-fire, but the team takes responsibility. The team takes accountability for getting the results. People are more willing to share resources, put maybe their smaller goals, their smaller objectives to the side so that the team can achieve its bigger goals. That kind of accountability only exists when the other three are really present. IVAN: And it feels like the last one, Results, is kind of what the destination is right? 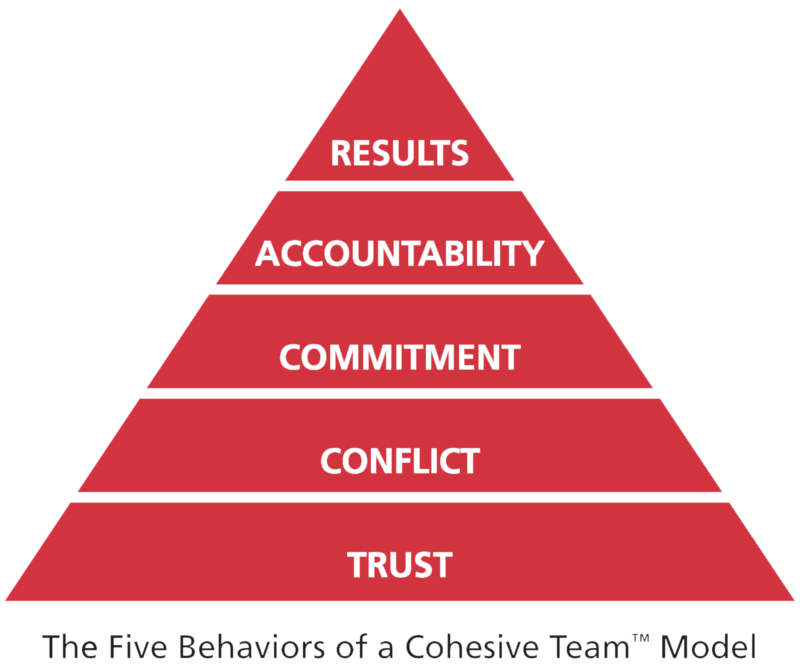 So, the fifth behavior is Results and it doesn’t feel like you can have true team results if you haven’t been able to accomplish the other four underlying pieces of the pyramid. ERIC: Mhm. It is. Even sharpening that focus on the results, the cohesive team versus the dysfunctional team. The dysfunctional team gets distracted by the shiny objects. The dysfunctional team kind of gets blown from side to side, depending on what’s new happening, or the latest emergency, or the latest issue. The truly cohesive team stays laser-focused on the results that they need. It’s not that they aren’t aware of these other things that are happening, but they make sure they get them. It does show the difference, I think, between that cohesive and that dysfunctional team. The dysfunctional team gets easily distracted, cohesive team reminds themselves that they got a bigger result, something bigger they committed to, and they are hyper-focused on that. IVAN: So, just to kind of summarize. The bottom of the pyramid is Trust, the vulnerable kind of trust that produces positive conflict that you can commit to right? So it goes Trust, Conflict, Commitment from the team, Accountability and then Laser Focus on Results. ERIC: Couldn’t have said it better in fewer words. IVAN: You’re so nice. It’s awesome. I like saying things back because it really solidifies my understanding of the pyramid and of anything, and I’m glad I got it right. So presumably there’s, and I know the answer, but I’m going to ask you anyway, presumably there’s a way to measure these behaviors right? How do we measure them? ERIC: We measure them by asking team members who are on the team. So, we administer a very short 20-question survey, which basically asks teammates to rate how the team is doing in those five behaviors. We don’t say 'do you trust Ivan?' But what we do ask is about behaviors linked to that. Questions like 'is the team willing to engage in unfiltered debate?' 'Will a team member call out another for their performance?' So we ask some questions to help understand whether these behaviors are present or not. So, that’s how we measure them. IVAN: And you do that as a team assessment right? ERIC: Mhm. Yea, we ask each team member their opinion, because if there’s ten people on a team, there’s probably ten different opinions. We get a good sense of where the team is at. Sometimes there are different views of how that team is working. Some people think it’s going great, and some people think not so much or somewhere in the middle. IVAN: The team assessment is based on some theory and some data that is connected to, or maybe it’s even part of the five behaviors of a cohesive team book? ERIC: Yes. The book is authored by one of, I think, the true visionaries in this field, Patrick Lencioni and when the book initially came out, it was called "The Five Dysfunctions of a Team." It was a parable about a team, so it was a story about a team that had five problems, five dysfunctions, and he uses that story to kind of connect with people. Some of the typical problems that teams have. From that, he really developed a process for helping those teams improve. We’ve taken that, we use his assessment, it’s part of our toolkit, so we use that assessment through a partnership we have with them and it’s been a really impactful assessment for our clients. IVAN: It’s not just a team assessment. So you will also do an individual assessment as a member of the team, and I’ve had experience with Meyers Brigg in the past, and I know that other people listening will have heard of ENSJ and IFTJPRST, whatever the letters are, but Myers Brigg is not the individual assessment that you do. You do something else called the “DiSC analysis”. Can you talk me through what the DiSC analysis is and maybe how it relates to the team assessment? ERIC: We use for two big purposes. One, team members, I like to say that great teams are made up of self-aware individuals, so when people know themselves really well, they’re better able to say “hey, I struggle with this thing”. “I struggle with talking to clients about problems they’re having.” Or, “I’m struggling with figuring out a plan to deal with this issue.” So if you know yourself, or maybe know some of your patterns, you know how you behave in different situations or you know how you behave in stress, you can adjust your behavior and other people can help you with that. So, know thyself first, and then once you know your teammates' behavior and how your teammates prefer to work, and think and act, maybe you don’t demonize them quite so much. So it’s not that boy, Eric just doesn’t care about the details. It’s that Eric is focused on moving quickly and doesn’t always think through his plans so I can help Eric with that. So teams that understand their DiSC styles, that’s how we used it. We help people understand themselves and their teammates. The tool of the DiSC is a psychologist test that just tests for your tendencies when your faced with different situations. I don’t know if that fully answered your question. I feel like I took a left turn and then a right turn and then a left again. IVAN: So the DiSC analysis much like the Myers Brigg is a psychological profile of an individual, but it also, if you put a number of different DiSC profiles together, maybe in conjunction with a team assessment, you would be able to tell how certain individuals might react to behaviors of other individuals on the team, and this formalism will help you maybe change your pattern of behavior. Or, maybe not just change your pattern of behavior but understand why others are behaving in a certain way. ERIC: Yea. I’m glad you brought that up. The mix of styles on a team creates a team behavior, and by understanding that, by looking at how team members interrelate with each other, how they work together, you’ll start to see how some of the challenges that a team might be having can kind of manifest themselves. It gives team members a way to talk about what’s going on. So it gives them a language for it. I don’t know about every team out there, but a number of the ones that I end up working with, they don’t always have a way to talk about what they’re feeling, but it gives them some words to express what’s going on, and it can resolve the issues then. So, the DiSC style definitely helps you understand and get some incites into how teams can adjust their styles, adjust their behaviors to be more productive with each other and more effective. IVAN: Would you mind spending just a little bit of time describing what the DiSC itself is? It’s a circle that has four quadrants, and humans, people that we work with and ourselves, are basically a dot somewhere on the circle and depending on where you are, you are more likely to have certain traits associated with the position in the circle. ERIC: If you imagine like you said, some sort of grid, we use it, it’s a circumplex. So google that if you’re not sure. If you google DiSC and circumplex you’ll see it. There’s a lot of people out there that are interested in this model. It’s been very useful for over 40 years. It’s been used in business for over 40 years. A lot of professional settings. Think of the vertical access. So, if you’re at home, draw a line up and down on a piece of paper and at the top of that access, if you’re the kind of person that is action oriented – I say shoot first, ask questions later – you like to get going – let’s get started, let’s move quickly, you’re really thinking about moving fast, you’re at the top of this line that you’ve drawn on a piece of paper, the northernmost point. Or, you might be the kind of person at the other end of that line, that’s north/south line, so you’re at the southern point. You’re the kind of person who might like to have a plan. Might like to think things through. Maybe get some reflection time built in or do some thinking on it or collect some data. So you’re that kind of a person. You’re ready, aim, aim, aim. Aim. Let’s double check and then fire. So, you’re more patient kind of a person in that other spectrum. Or you might be somewhere, anywhere in between on that line, you know, people are very complex. So that would be the north/south access of this model. The East/West access. On that side of the DiSC think of yourself, if you’re the kind of person who is more interested maybe in information and data, you like to make sure that you have the right intelligence, the right information to be able to make a decision or to solve a problem. So you’d be on the left or the west side. On the other side of that line, if you’re on that line that’s intersecting here, so the right or the east, you are the kind of person who’s more people oriented. Who might be often thought of as like an extrovert, you get energy from people. You’re more accepting. You’re usually fairly kind of a warm person. So contrasted with again on the western side, you’re more skeptical. The western left side is the skeptical side. You’re questioning – you're skeptical. ERIC: Yea, challenging. Great word. On the east you’re open, you’re warm. IVAN: We’re going to record a Podcast. ERIC: We’re going to record a Podcast. It’s going to be fun because, why not. ERIC: So, they also get results and they want to get fast results, but they’re focused on getting results through people. So, these are sometimes people that are natural salesmen, they’re very energetic, very bubbly, probably talk with their hands a lot. IVAN: Says Ivan, waving his hands. ERIC: On the lower right then, so shifting again. We’re going around the clock here. ERIC: Yea, three, four, five, six o’clock, in that range there. Southeast, bottom right. It’s a Steadiness style. So again, these are warm people. They’re often not so quick paced. They’re a little more planful, methodical. These are people who when they wake up in the morning they often wake up a bit earlier than other people. They’re thinking about changes and “have we thought enough about the impact of these changes on people?” “Have we really considered how this is going to affect our customer, our client?” “Have we considered how this is going to impact employees?” “Isn’t this going to be really stressful?” “Don’t we have a lot of change happening right now?” So they’re thinking a lot about change, and specifically how it’s going to impact various groups of people. So that’s the Steadiness style. Some people say the greatest listeners exist in that Steadiness quadrant. So if you move over one more, we’re at six, seven eight almost nine o’clock here, this would be the lower left-hand corner or southwest. This is the Conscientious style. So Conscientious style is otherwise the C style. When they wake up for work in the morning and they’re on their way in, they’re thinking about “oh, boy, today's the day we’re going to get that data. I can analyze that data. I can spend time with that data. I’ll really understand it. And then we’ll be able to make the right decisions. We’ll be able to move forward on the project. We’ll be able to get the right plans in place to execute this flawlessly.” If you’re a Star Trek fan, this is Spock, so, very thoughtful, planful, logical. ERIC: Yea, logical’s probably the best word to describe it. IVAN: Wants accuracy and perfection. ERIC: Absolutely. Yea, accuracy is very important. Being viewed as competent is very important to this style. 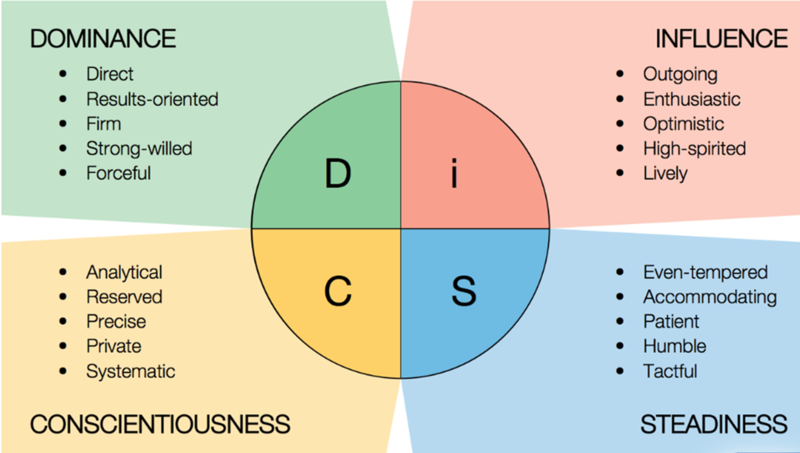 That makes your way around the horn there, that’s D, I, S and C and that’s how we get the DiSC in the name for the assessment, but that helps you understand these are four basic categories of people. Obviously, people are more complex than that, but it gives us the start of the assessment, and the assessment really dives in and helps people understand even better more about themselves and some of the nuances that makes it them. But for an audio podcast, this has probably already confused a few people. IVAN: I hope not. Maybe not. And if you’re following along in the show notes and in the transcript, we’ll have links to the various official documents that describe these in pictures and so on. I’m sure there’ll be readers or listeners that’ll follow those links and find out more. What makes me really glad that we went down this path with Employee Strategies is that it truly made me more aware of how other people on the team actually behave and selfishly how I can change or interpret that behavior. So, if I go back to what we were saying a whole lot earlier on is, we were talking about this pyramid which was how the team functions and what our general goal is at getting there and how we get there with this basis of trust. So that was the team assessment, and the individual assessment that’s the DiSC analysis that we’ve chosen to use intersects and works so nicely with this pyramid because it allows me to think about how I interact with the people I do on a daily basis, who are on that team, and allows me to make that experience for myself and for them a whole lot better, so we can get to those results that we’re chasing on. The way I think about other people’s interactions with me when I know where they are on the DiSC analysis, compared to where I know where I am on the DiSC analysis, really helps me understand their behaviors. So, going through this process with you of figuring out where we are in this pyramid, but also where each individual on the TEN7 team is on this DiSC, really is useful. So what I noticed is if we talk about the TEN7 DiSC, a majority of the people on our team are in the lower left quadrant. So, the C, so the more planful, the more desire to check and as you said, ready, aim, aim, aim, aim, do another double check, then fire, that’s really wonderful that we have the majority of the team there, but it does kind of beg the question of where is the rest of the team and how does a team that’s clustered around one quadrant of this analysis, how is that different than another team that might be spread out across the DiSC? ERIC: When you’re all in one or if you’re predominantly in a specific characteristic, you know there’s an old saying “any strength overused becomes a weakness.” And so, a team that might be clustered in one region and then doesn’t adjust its style, if it didn’t adjust its style, and we’re all adults and we should all adjust our style to different situations. So, because Eric’s an IS, and I’m a blend of two styles if I just am always that, boy I’m missing out on some opportunities to be effective. So, a team, if it doesn’t adjust it’s style if it doesn’t come up with strategies for responding to emergencies, that could be a problem for a conscientious style team or a team that’s dominated by that style. Do they move quickly enough when a problem arises? Are they over analyzing things, maybe over-analyzing everything? Having too many plans in place could prevent you from just adapting and going with the flow a little bit in situations that call for it. If you’re overdoing it that gets in the way of getting the results that you want right? So hopefully having that language and having that awareness, that sounds like that’s helped your team, but my hope is that that exists for all teams. If all teams can take a step back and really look at that and decide if they need to adjust their styles. If they adjusted their styles could they get even better results? Teams that have that, I think you described it almost as like a natural advantage, where they’ve got all different styles just naturally intermixing, that can be great, or it can be a source of conflicts too. ERIC: Yea, if teams don’t have the language to talk about it. If they don’t recognize that they have this diversity of styles and appreciate that, or if management isn’t aware of it, maybe management has a preferred style there, and they don’t have a way to talk about that difference, that can get in their way too. So, it can increase the conflict on the team and the stories they tell about each other. IVAN: A team that’s clustered has to flex so that they can reach the other quadrants of the DiSC analysis. Does that mean that maybe a team that’s scattered on the DiSC doesn’t feel the need then to flex at all because there are other people on the team that should be contributing that aspect of the DiSC? ERIC: Well, you’re going to hate this answer, maybe/maybe not. It depends on the team and the needs of the team. The work is the work. Any style can get results. I described the I style as maybe a natural salesperson. I know some wonderful salespeople who are C styles, which are the opposite of that I style. They plan, they prepare, they think through the conversation, they never go to a sales meeting without knowing exactly the answer to every question that they might get asked. So, I think a team member and a team, probably needs to adjust to the work and think about what’s needed in the work and so it may or may not mean that they have better results or an easier time. It just depends on the maturity of the team members and the work. IVAN: So I want to kind of bring you back to the beginning and kind of just remind us why are we talking about this? Why are we talking about the human element on a team? I just want to say that part of the Blueprint for Operations is how a team works with each other and how individuals work on the team. The other parts of it are mostly logistical. They’re mostly descriptions of particular processes, particular tools, particular ways of doing things that we’ve had luck with, that we’ve experienced, that we’ve adopted as best practices from other places. This is the part that talks about how the humans and the people on this team actually interact with those tools and those processes. And my feeling is that this is an important part of the Blueprint because it will, and I’m going to go out on a limb here and say, if you don’t get this part right, your adoption of those tools and those processes on a team is likely to be worse than if you had this in place. That’s my kind of observational assessment. I think it’s true. I mean you could probably speak more to that. ERIC: I think you’re on a pretty strong branch there. This password manager, if you don’t pick the right tool for you, your process might be clunky, overly cumbersome or not secure enough or you might encounter some problems if you don’t engage in the right conflict, and when you got issues that come up, deal with them and move on. So I think having the ability to perform as a team and engage as a team increases the likelihood that your adoption is going to be more successful and also that your team performance and the sustaining of it, will be successful. So you’re essentially insuring your investment, because it’s not cheap to change. You’re buying new tools. You’re investing in changing processes, which takes away from doing other things, maybe serving your customers, your clients, or doing the work. So make it stick. I think you have to make it stick. And what you’re describing here is a way to make sure that your investment pays off for you. So I think it’s really smart of a leader to do that. IVAN: There’s so much more we can talk about Eric, but I think we’re reaching the end of our Podcast. Will you come back and let’s talk some more? IVAN: The next thing I want to talk about is Simon Sinek and the Golden Circle and Ground Rules for Meetings and above the line and below the line behavior. It might not necessarily be exactly part of the Blueprint series, maybe it is. We can figure that out. But I love that whole sentiment from Simon that people don’t buy what you do, they buy why you do it. So I’d love to talk about that whole Why statement and why it’s important to have something to coalesce around. ERIC: I’d be thrilled to come on. If you can’t get Simon, I’m a great second option. ERIC: You know what. I’m totally better. IVAN: Eric, thank you so much for spending your precious time with me. ERIC: Thank you for having me. It’s always a joy to connect with you and work with you. So, thank you for having me on. It’s been an honor. IVAN: It’s my pleasure. So Employee Strategies is online at esinc.mn. Visit their website to find out more. You’ve been listening to the TEN7 Podcast. Find us online at ten7.com/podcast. And if you have a second, do send us a message, we love hearing from you. Our email address is podcast@ten7.com. Until next, this is Ivan Stegic. Thank you for listening.